One Dane Ynleborgaz (Zagrobelny spelled backwards), the sole person behind black metal entity Angantyr, may have moved from Denmark to Sweden, but his protagonist Arngrim continues his travels and travails in the next Angantyr installment called Forvist. Wronged by Christians, his family destroyed, Arngrim is on a mission of revenge. Not equipped with lyrics for Forvist (and even if I was, translating from Danish isn’t my forte), I can’t tell what happens next in Arngrim saga, but weary traveler from all the mileage he is definitely not. With the exception of an acoustic opening to the album on Lænket and the beautiful outro on Stille Skarpe Knive, Arngrim journey is set to vibrant and melodic black metal. Somewhere in the middle of the previous album Svig Ynleborgaz apparently had an epiphany and the urge to really inject melody into his interpretation of Nordic black metal, and the aesthetics on Forvist really did not change. There is no question that the man can come up with a moving melody, but there is even less doubt that given a melody he can set it to a tremolo and blasting/double bass percussive support. In just about every song Ynleborgaz changes the rhythmic pattern halfway through, for the things not to get stale, but he never forgets to get his hooks in. If you like Kampfar, Gorgoroth at their most melodic and early Amon Amarth in their blacker moments, you can get an idea what Forvist sounds like, and if you followed Angantyr earlier, then you know exactly what to expect. In that sense, Forvist may have felt that it did not push the envelope any further, and with songs being lengthy with multiple repeating parts, this could be on the verge of bloated, but, fortunately, it never gets there. For the faithful Forvist won’t disappoint, for the uninitiated it won’t disgust, but waves of very differing emotions, this album is not likely to bring to the listener. Those halfway song changes I mentioned earlier are very nifty way to create variety on Forvist. Intensity brought on by blasting subsides on Lænket and I Forfædres Fodspor for the pride to shoot way up (and do I hear Moscow Nights @ 4 min in I Forfædres Fodspor?). Vemods Hjemstavn starts minor and brooding, only to come out swinging 5 min in, supported by a great singalong chorus set to a double bass drum pattern. Starting rawer Stille Skarpe Knive switches to hooky and melodic, only to roll back into rawness before succumbing to the acoustic guitar. 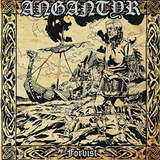 Periodically changing from threnodious to dramatic, with a layer of fried vocals to boot, Angantyr’s Forvist represents another rousing battle cry. It feels too that with Arngrim setting off to see at the end of Skovens Egne Våben the story is not over and we will hear from this band again, the narrative most likely unfolding along the same lines.